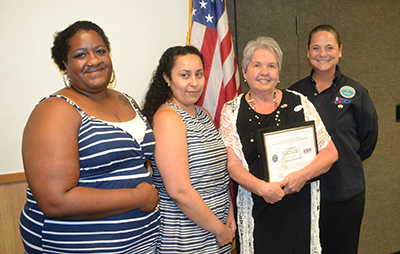 The National Guard recently presented Patriot Awards to EDCOE and two Child Development Program supervisors for going above and beyond to support an employee whose husband serves in the National Guard Reserve. Any member of the National Guard, Reserve, or the spouse of a member may nominate an employer who has provided guidance, commitment, and support to them or their family. EDCOE, Assistant Director of Child Development Programs Gail Healy, and Disabilities/Mental Health Coordinator Stacia Ponce received the awards at a County Board of Education Meeting in June.